Lysias, a resident alien at Athens in the late fifth and early fourth centuries B.C.E., acted as a consultant for clients involved in litigation and put into circulation written versions of the speeches that he composed for them. In the early Hellenistic period, a corpus of more than four hundred speeches was ascribed to him; however, literary critics in the first century C.E. formed the opinion that scarcely more than half that number were correctly ascribed. In late Roman times, a small selection of speeches was made without regard for the opinions of critics on authenticity, and that selection has survived. Our knowledge of the remainder is fragmentary and indirect. K. J. Dover examines the extent to which, and the means by which, the work of the individual Lysias can be distinguished within the total corpus ascribed to him. One part of the examination is an attempt to reconstruct the entire process of transmission, from the making of the late Roman selection through the internal arrangement of the corpus in ancient editions to the relation between client and consultant at the time of writing. The other part evaluates the criteria used to establish authenticity: chronology, ideology, and style. Dover concludes that any demand for a clear division of the speeches into two categories, authentic and spurious, is unreasonable and methodologically unsound. Instead, we must content ourselves with degrees of probability and treat the corpus as presenting us not with an individual but with certain aspects of Athenian art and society. This title is part of UC Press's Voices Revived program, which commemorates University of California Press’s mission to seek out and cultivate the brightest minds and give them voice, reach, and impact. Drawing on a backlist dating to 1893, Voices Revived makes high-quality, peer-reviewed scholarship accessible once again using print-on-demand technology. This title was originally published in 1968. 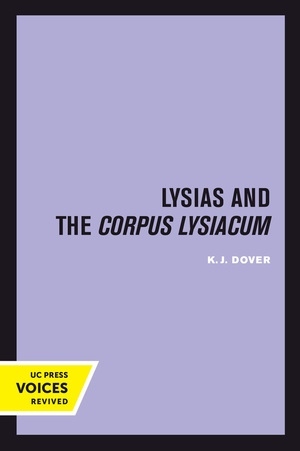 K. J. Dover was Professor of Greek at the University of St. Andrews, Scotland. He was the Sather Professor of Classical Literature at the University of California, Berkeley, in the winter quarter of 1966–67.